Last post, we talked about radical inequalities. 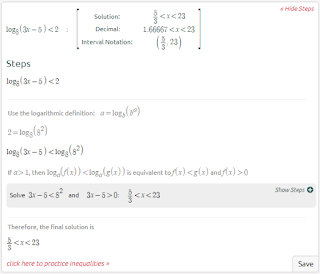 In this post, we will talk about how to solve logarithmic inequalities. We’ll see logarithmic inequalities in forms such as \log_b(f(x))<a or \ln(⁡f(x))<a. 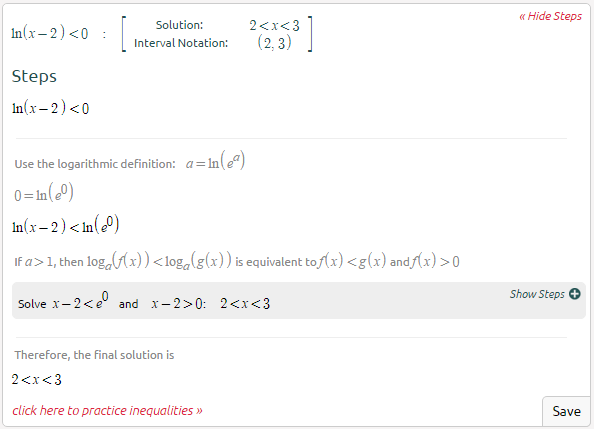 In order to solve these inequalities, the goal will be to isolate the variable, just as in any inequality, and we will do this by getting rid of the log function. 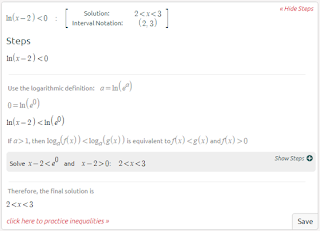 Let’s dive in and see how to solve logarithmic inequalities. Let’s do an example step by step now. There’s nothing to move, so we can skip this step. We can see that this is now a rational inequality. We won’t solve this step by step; I will show the answer after solving this inequality. 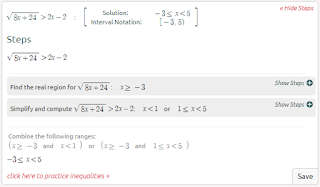 If you are struggling with solving this inequality, visit the blog post on rational inequalities. That wasn’t too bad! Let’s see some more examples. 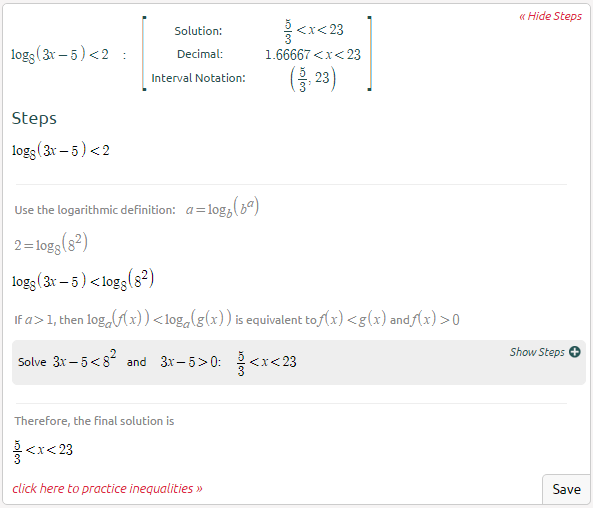 Solving logarithmic inequalities is not too difficult. Just remember to get the ranges inside the logarithmic expressions and to double check your work. For more help and practice on this topic visit Symbolab’s practice. Last post, we went over how to solve absolute value inequalities. 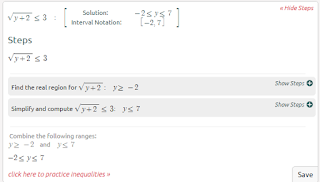 For today’s post, we will talk about how to solve radical inequalities. Solving radical inequalities is easier than solving absolute value inequalities and require fewer steps. 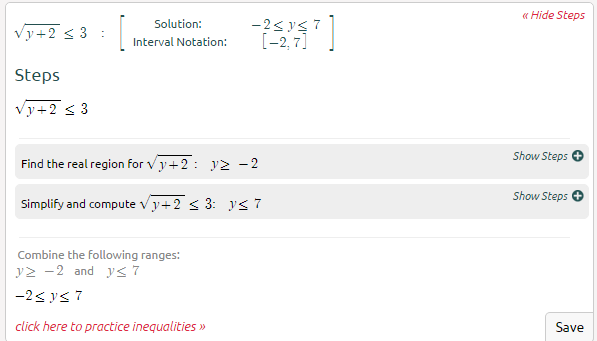 Let’s see the steps on how to solve these inequalities. Let’s see how to do one example step by step. Yes, this inequality is true the radical is not less than 0. That wasn’t too difficult. Let’s see some more examples. 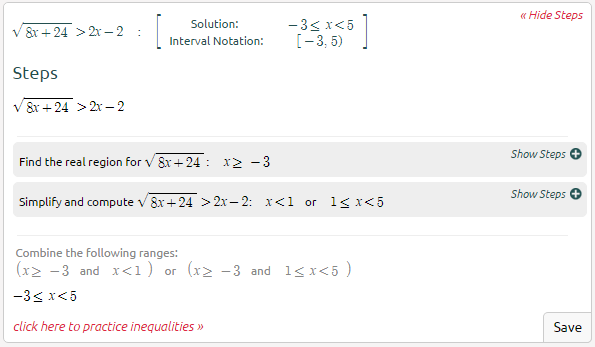 Solving radical inequalities isn’t too difficult, however, they require practice. For more practice examples check out Symbolab’s practice. 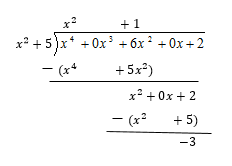 Last post, we talked dividing polynomials using factoring and splitting up the fraction. In this post, we will talk about another method for dividing polynomials, long division. Long division with polynomials is similar to the basic numerical long division, except we are dividing variables. This is where it gets tricky. I will talk about the steps to dividing polynomials using long division to help make the process easier and go into detail. This may seem a bit confusing, so we will go through two examples step by step to understand better how to solve these problems. We can skip this step because there are no missing terms. Dividing polynomials using long division is very tricky. It is so easy to skip an exponent, have an algebraic error, and forget a step. This is why practicing this type of problem is so important. The only way to get better at it is to keep practicing it. Check out Symbolab’s Practice for practice problems and quizzes.